For the world, for the people, Daitarn 3 will smash the ambitions of the Meganoids. If you don't fear the shine of the Sun, then bring it on! The Unchallengeable Daitarn 3 (無敵鋼人ダイターン3, Muteki Kōjin Daitān 3, lit. Invincible Steel Man Daitarn 3) is an anime series created by Yoshiyuki Tomino and Hajime Yatate, and produced by Sunrise. It was first broadcast on Japanese TV in 1978. The series lasted for 40 episodes. The opening theme Come Here! 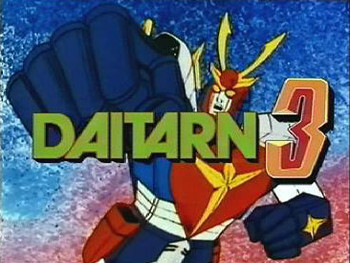 Daitarn 3 is sung by Makoto Fujiwara. Sōzō Haran was a brilliant scientist that was conducting research on Mars. He created a form of cyborg life with the ability to think for itself. These cyborgs, dubbed the Meganoids (メガノイド, Meganoido), soon ran out of control and killed Dr. Haran along with his whole family, save his youngest son, the 16-year-old Banjō Haran. Banjō escapes from Mars on a rocket with a solar-powered super robot called Daitarn 3, which was built with the special metals of Mars. Now 18 years old and living on Earth in a luxurious mansion, Banjō fights against the Meganoids with the aid of his faithful butler Garrison and his two gorgeous companions, Action Girl and ex-INTERPOL agent Reika Sanjo and his childhood friend Beautiful "Beauty" Tachibana. Oh, and Bratty Half-Pint Toppo, a surprising crack shot who they picked up from a city that got levitated off the ground by the Meganoids in episode 2 and then stays with Banjō & Co. for no apparent reason. Together they must stop the evil Meganoids which aspire to turn all humans into cyborgs and thus "improve" the human race. '70s Hair: Banjo has very long sideburns, and thick, unruly hair. His female companions have long, puffy hair. Adjective Noun Fred: As noted above, the series' full title is Invincible Steel Man Daitarn 3. Attack of the 50-Foot Whatever: Every single Meganoid Commander — and even some of the normal foot soldiers — can become a Megaborg. Badass Creed: "For the world, for the people, Daitarn 3 will smash the ambitions of the Meganoids. If you don't fear the shine of the Sun, then bring it on!" Big Bad: Don Sauzer, the leader of the meganoids. Bittersweet Ending: Banjo may have defeated the Meganoids, but by doing so became nearly as bad as those he fought against in the process. He fought the Meganoids not out of simply wanting to do the right thing, but out of sheer rage and revenge, and he never truly understood that he and the Meganoids were Not So Different. By defeating the Meganoids, he also kills a loving husband (Don Sauzer), and a woman who only did what she did out of love for said husband and in an effort to try to find a new home for the Meganoids so that they wouldn't have to attack the Earth. (Koros.) When he realizes just what he's done, he tells himself, "I'm sick of this" and doesn't say another word before he leaves Mars in disgust. If that weren't enough, nearly every single one of his friends and allies leaves him in the last few minutes of the show. In the end, he has nothing left but his home, his fortune, and the Daitarn, with everyone else having come and gone. The show closes on the window of a lone lit room, presumably Banjo's. The Meganoids may be gone, but so is everything else. Blade on a Stick: Daitarn Javelin. Breaking the Bonds: The opening has this, except Banjō doesn't break tying ropes. He breaks prison bars. Bruce Lee Clone: Wong Law that appears in episode 10. Powers include martial arts skills, nunchucks, speed, levitation, a Chinese sword, and a broadsword. By The Power Of Gray Skull: Banjō calls Daitarn 3 with a press of a button and a yell of "DAITAAA~RN...COME HERE!" Calling Your Attacks: Anything on this page with "Sun" or "Daitarn" at the beginning of its name is invariably shouted before firing. Conveniently an Orphan: Banjo lost his family when he was sixteen-year-old. Crazy-Prepared: A strip of platinum is all it takes to counter the effect of the Meganoids' brainwashing liquid. Banjō keeps one on his person at all times, just in case he's captured and dumped in a vat of the stuff. Crimefighting with Cash: Much of Daitarn 3's operating cost and Banjo's actions in general are self-financed. Death Dealer: Megaborg General Edwin. The Dragon: Koros. In the final episode it turned out that Koros was Dragon-in-Chief whole time because Don Zauther was inactive and he only awakened in finale when Koros was defeated. Epic Flail: Daitarn Hammer and Meganoid General Sandrake. Banjo is basically James Bond with a Humongous Mecha and blue hair! His reliable butler Garrison of Alfred from Batman. Expository Theme Tune: "Come here, Daitarn 3, Daitarn 3! Take the sun's radiance into your chest." The Fellowship Has Ended: A example that seems strange in its simplicity In the final episode , After The Hero Banjō defeats the enemy on Mars, the next scene is at his Mansion: Action Girl Reika Sanjo and Tag Along Kid Toppo say goodbye to Battle Butler Garrison and Spoiled Sweet Beautiful "Beauty" Tachibana, who takes her limo to her parents mansion. Garrison closes the mansion and takes the bus to an unknown destiny. There is only a light in one solitary window at Banjos mansion. The End. Finishing Move: The Sun Attack! and subsequent DAITARN CRASH! flying kick that respectively carve and punch a hole through Megaborgs. Frickin' Laser Beams: Sun Laser. Good Is Not Nice: Banjō only tries to destroy the Meganoids (and even then, he is willing to spare those who aren't all that bad), but is determined to be ruthless if need be. He Who Fights Monsters: Banjō becomes this in the final episode. BANJO: I'm sick of this. Humongous Mecha: Standing at 120 meters tall, Daitarn was among the largest before Studio Gainax decided to have a crack at the largest mecha ever. Improbable Age: Banjō is seriously 18 years old, even though he looks like a man in his thirties and have graduated several colleges, been a member of CIA for quite some time and has traveled through various countries A LOT. In the Name of the Moon: "If you don't fear the shine of the Sun, bring it on!" Limited Wardrobe: Played straight with Banjō, Toppo and Garrison; averted for the two bond girls female sidekicks. Also, defied in episode 20: Koros captures both Beauty and Reika, turns them into Meganoids and sics them on Banjō. Banjō kills them both, then explains that he noticed "Beauty" and "Reika" are wearing different clothes than the ones they left home with, and therefore are two female Meganoids disguised as Beauty and Reika, who indeed are still being held captive by Koros. Lighter and Softer: Frankly, anything out of Tomino's portfolio barring Ideon would be Lighter and Softer compared to the Child Soldiering and rampant terrorism of Zambot 3. An interesting point to note is a light comedic element running through the whole series - the Meganoid foot soldiers exert some of their own personality with witty banter, bringing a fresh change to the silent drones which permeated super robot series previously. Love Makes You Evil: Pretty much THE whole reason for what Koros is doing. Banjō's full name, Haran Banjō, is a homophone of a Japanese phrase, 波乱万丈, which means "stormy and full of drama". Beauty full name is Beautiful Tachibana that refer to her physic attribute. Ms. Fanservice: Beauty. She appear often in skimpy outfit and has two naked scene. Once an Episode: "Borrowing the power of the Sun! Sure-kill attack! SUN ATTACK!" and "DAITARN CRASH!" The Power of Love: Quite literally in episode 17: Reika uses her pink, heart-shaped mind-beams of love to convince a man with Psychic Powers to refrain from killing Banjo. The Power of the Sun: The Sun Attack: Daitarn 3 fires a large burst from its head ornament. Paper Fan of Doom: Daitarn 3 carries two of these. Note that Daitarn 3 is actually a Humongous Mecha. And Daitarn uses them for defense. Which may or may not be more outlandish. Precision-Guided Boomerang: BIG WEB! mounted on Daitarn 3's chest. Primary-Color Champion: Daitarn is mainly blue and white with some red and yellow parts (helmet, chestplate and holsters are red). Redemption Earns Life: Despite his personal hatred of the Meganoids, Banjō is more than willing to let the ones who show they are capable of love or are honourable live as long as they don't kill humans; he even offers most of his enemies multiple opportunities to surrender during his battles. Red Is Heroic: Banjo's combat suit is dark-red. He also wears a red jacket. Spell My Name with an "S": Don Zauther? Don Sauzer? Don Zauker? Which one is correct? Spiritual Successor: Of Zambot 3. The Big O is often considered a spiritual successor to Daitarn 3 as well. Super Prototype: Daitarn was originally built as a testbed for Megaborg technology. Swords Akimbo: The Daitarn Zanbers, stored in Daitarn's knees. This Is a Drill: Meganoid General Katrof used these. Third-Person Person: Meganoid Commanders are very prone to this. Tomato in the Mirror: There are a few hints imply that Banjo may be a Meganoid of some kind. Transforming Mecha: Dai-Tank and Dai-Fighter modes. The Unintelligible: Don Zauther. Until episode 40, that is. Unwilling Roboticisation: The Meganoids' master plan is doing this to ALL humans. Well-Intentioned Extremist: The Meganoids in general, as they want to "improve" the human race. Wrench Wench: Reika is usually the one performing field repairs on the Mach Attacker, and on at least one occasion she gives instructions to Banjo when he's repairing Daitarn. You Gotta Have Blue Hair: Banjo has dark-indigo hair.